It is semi-final week for the remaining contestants, who know they are just three patisserie challenges away from the biggest day in their baking lives. 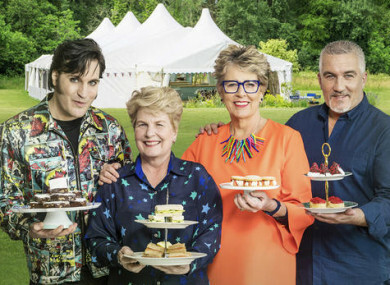 First comes the Signature and a deceptively simple challenge, with Paul Hollywood and Prue Leith looking for perfection, followed by Prue’s complex, multi-layered Technical. The pressure intensifies when they are asked to create a spectacular Showstopper that could grace a Parisian patisserie – but who has the skill to reach the Bake Off final and who will fall at the final hurdle? If you still haven’t made up your mind, David McCullagh presents the second last television presidential election debate of the campaign. The pianist welcomes artists including New York rockers Interpol, Manchester MC and grime star Bugzy Malone, and Brit winner Rag’n'Bone Man. Also gracing the studio are California’s eccentric bluesman Fantastic Negrito and London-based expansive guitar band Another Sky. Leati Joseph Anoa’i, professionally known as Roman Reigns, announced that he will relinquish the WWE Universal Championship title and take a leave of absence effective immediately. “I’ve been living with leukemia for 11 years, and unfortunately it’s back,” the wrestler said. He decided to take his battle public in an effort to raise awareness and funds for research into cures for the disease. SEAL Team (Sky One, 9.00pm) New series. Jason and the team go into action when militants take hostages on an oil rig in the Gulf of Guinea. Return of the action drama, starring David Boreanaz. Champions League Live (RTÉ Two, 7.00pm) It’s Manchester United v Juventus, with kick-off at 8.00pm. Informer (BBC One, 9.00pm) Drama, starring Paddy Considine.